Exotic-O-Rama is certainly the most absurd and out-of-the-ordinary, the most fun and convivial series of ‘50s and ‘60s tunes yet compiled by dear ole El Vidocq. And Volume 2 presents a selection even more audacious than its smashing predecessor. 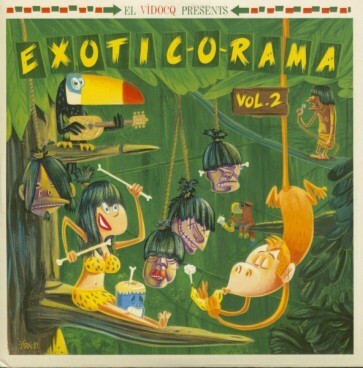 Embark upon an eclectic safari through a lush pacotille of melodies, from groovy R’n’B mangroves (The Ramrocks) home to nestling toucans (The Century Five), to head-shrinking rockers (Bob Vaught) and doo-wopping crocs (The El Capris), not to mention a few veritable birds of paradise (Rosco Gordon)... Wildlife worthy of an Ed Wood flick! But while the ambiance often turns outrageous, keep in mind that these exotic ditties were concocted by the same trailblazing performers who would inspire Lux Interior of The Cramps and Fred Schneider of the B-52s... While most of the groups comprise colorfully daubed Yanks, there’s also a stray Italian (Franco Ei "G5") and a passel of playful Mexicans (The Stardusters). The album art, signed Jampur Fraize, is one of the most sumptuous to date, which is saying something.